One of the modern feats of architecture and an ode to India’s ancient history and culture, Akshardham Temple is one of the most visited temple in Delhi. Located on the banks of River Yamuna, the temple is dedicated to the Swaminarayan sect of Hinduism. The temple complex is a source of spirituality. There are a number of exhibitions that display the life Swaminarayan and the history and culture of India. The spiritual journey is made enriching with other features in the complex that include the musical fountain show, boat rides, beautiful garden, etc. Delhi’s most beautiful temple, Akshardham Temple Complex is grand, picturesque and in every way nothing less than wonderful. The majestic beauty of architecture, oasis of spirituality and the vast knowledge of history, culture and heritage makes it one of the best places to visit in Delhi. Families with children, elderly people and everyone must pay a visit to the magnificent complex near the River Yamuna. 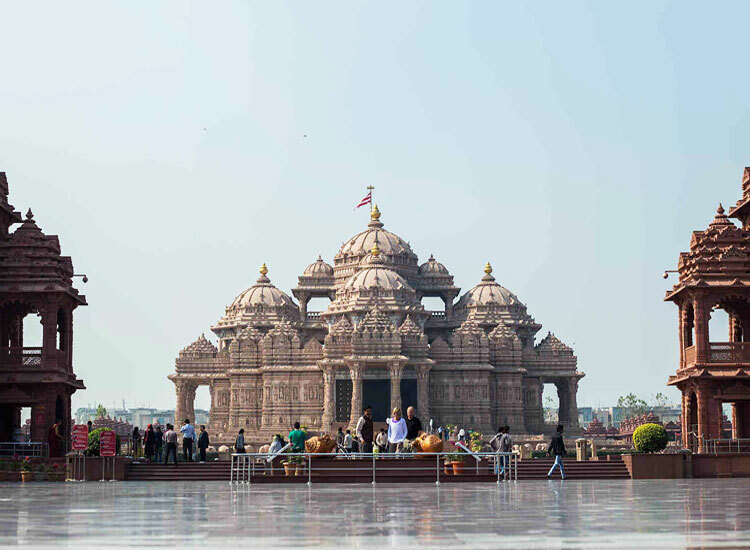 With our complete Akshardham Temple Complex Guide, check out all the interesting sights, things to do and get all information about temple. Akshardham Temple history is as interesting as architecture and attractions. It was a vision planned since 1968 by Yogiji Maharaj, the spiritual head of the Bochasanwasi Akshar-Purushottam Swaminarayan Sanstha (BAPS). Yogiji had a desire to build a grand temple built on the banks of the Yamuna River praising Guru Swaminarayan and India’s vast history since the Vedic times. Construction on the temple began on 8 November 2000 and was officially opened on 6 November 2005 by the then President of India, renowned scientist Dr A.P.J Abdul Kalam. Swaminarayan Akshardham Temple is named after the revered Guru, the leader of Bochasanwasi Akshar-Purushottam Swaminarayan Sanstha (BAPS). The temple worships their revered guru, Swaminarayan. The inner sanctum of the temple is home to Bhagwan Swaminarayan and his successor gurus. Considered to be the manifestations of Aksharbrahma, the gurus are God’s servants. The other deities of the temple include special shrines for the great avatar-and-devotee pairs: Shri Sita-Ram, Shri Radha-Krishna, Shri Lakshmi-Narayan, and Shri Shiv-Parvati. The Mandir conducts daily prayers, aartis and other rituals on a regular basis as per traditional practice. Swami Narayan was a 19th century spiritual leader, the founder of the Bochasanwasi Akshar-Purushottam Swaminarayan Sanstha (BAPS). Born in the late 18th century in Gujarat Bhagwan Swaminarayan has been hailed by contemporary civic leaders and modern historians as a great social reformer and an inspirational leader. He is praised for his contributions to the abolition of vice and superstition. Among other reforms, he preached the equality of all as atma, the soul. The guru strengthened the beliefs of Sanatan Hindu Dharma, and gained followers from all walks of life. Even after renouncing his mortal body, his beliefs live with his succession of gurus of the Swaminarayan Sampradaya. The grand Akshardham Mandir, built of pink sandstone and white marble is the focal point of this spiritual site in Delhi. 141 ft high, 316 ft wide and 356 ft long, the temple has 9 splendid domes, 234 intricately-carved pillars, 20 pinnacles and over 20,000 superbly sculpted figures. The temple complex is built according to India’s ancient architectural tradition. There has been no use of steel but the olden designs and layout. Guru Swaminarayan Murti, the tranquil, 11 ft-high, gold-plated murti of Bhagwan Swaminarayan is enriched in the temple. Other marvelous idols of Shri Radha-Krishna, Shri Sita-Ram, Shri Lakshmi-Narayan and Shri Parvati-Shiv. 24 beautiful creations of Keshav forms of the Divine, built from the Panchratra scriptures. A number of sculpted murtis of sadhus and devotees mentioned in Vedic mythology. Sculpted pillar tops which have murtis of 500 paramhansas. Expertly-crafted carvings of the 65 ft high Lila Mandapam, Bhakta Mandapam, Smruti Mandapam and Paramhansa Mandapam. Marble sculptures of life-events of Bhagwan Swaminarayan in Ghanshyam Mandapam, Neelkanth Mandapam, Sahajanand Mandapam, and Swaminarayan Mandapam. Specimens of ancient India’s engineering technology in form of domes and quad-rangle pinnacles. Akshardham Temple Complex has 10 massive and beautiful gates. The layout of the gates was planned according to the ten principal directions described in Indian culture. The gates, entryways reflect the Vedic sentiment of inviting goodness from everywhere to all visitors. The Gate of Devotion celebrates the Vedic tradition of dual worship. Offering devotion to God and his choicest Devotee is the genuine form of worship. Honoring this custom, 208 sculpted dual forms of God and His devotee decorate this splendid gate. A symbol of beauty and purity, Peacock also known as Mayur have their own dedicated gates. The national bird of India is included in the temple complex as they are believed to bring joy and color. 869 sculpted peacocks embellish each of the beautiful gates. The holy footprints of Bhagwan Swaminarayan is one of the places you must pay a visit in Akshardham Temple complex. The living memory of his time on earth, the footprints are carved out of white marble and are embellished with the 16 sacred signs of God. A continuous shower of water from four sacred conch shells pay tribute to his inspiring life and work. The 8-petal lotus-shaped creation built amid beautifully manicured lawns inspire Faith in God and Faith in Man through the wisdom of the scriptures, sages and other great thinkers of the world. Surrounding the Akshardham Monument on three sides, Narayan Sarovar holds the holy waters of 151 rivers, lakes and step wells of India, visited by Bhagwan Swaminarayan. Water flows through 108 gaumukhs on the side and back walls of the Mandir. The impressive two-tier colonnade in red stone encircling the temple has each tier is 3,000 ft long with 1,152 pillars and 145 viewing windows. The ornate external wall, Mandovar of the Mandir is 611 ft long and 25 ft high. There are 4,287 carved stones that includes 48 murtis of Ganeshji, and 200 sculpted figures of spiritual leaders, rishis, sadhus, acharyas, devotees, and divine incarnations. There is also a bronze relief panel that narrates the life of Lord Swaminarayan. The base of the Akshardham Mandir, one which the main temple rests is named the Gajendra Peeth. The 1,070 ft long panel comprises of 148 sculpted stone elephants, and dozens of other sculptures of people, animals and birds. Paying tribute to the glory of elephants and nature in Indian culture, the different life-like postures and expressions are intricate and truly a beauty to marvel at. Enjoy the stories of ‘Elephants and Nature’, ‘Elephants and Man’, and ‘Elephants and the Divine’. As the very name suggest the hall is a display of universal values for mankind. The very base of Indian culture, here visitors can learn about virtues such as, ahimsa, courage, endeavor, honesty, faith, etc. learn about instances from the life of Bhagwan Swaminarayan through films, light and sound shows with robotic figures. This hall plays a large format film that portray the true story of an 11-year-old child-yogi, Neelkanth Varni. Projected on an 85 ft x 65 ft screen, the film takes the viewers on an exciting pilgrimage. Shot in 108 locations in India, featuring a cast of over 45,000 people, the film is a spiritual journey through the majestic Himalayas, sacred places, festivals, traditions and values of India. A spectacular boat ride through 10,000 years of Indian culture, which flourished on the banks of river Sarasvati. The 800 statues, world’s oldest Vedic village and Takshashila, the world’s first university showcase the rich heritage of spiritual India. There are also mentions of discoveries and inventions of India’s ancient rishi-scientists, and much more. The Yagnapurush Kund is a large lotus-shaped replica of a traditional yagna kund. Every evening it is transformed into the spectacular ‘Sahaj Anand Water Show’. The show is a creative fusion of lights, lasers, fountains, projections, music and live acting narrating tales from the Upanishads. The Bharat Upvan spread over 22 acres of beautifully cultivated and artistically designed lawns, trees, plants and shrubs garden displays 65 bronze statues of India’s great men, women and children, whose lives inspire all to nobler heights. The Akshardham Temple is located close the banks of River Yamuna in New Delhi. The closest domestic and international airport is the Indira Gandhi Airport, 27 km away. The closest railway station is New Delhi Railway Station, at a distance of 11 km. DMRC metro Blue line Akshardham Metro Station is the closest drop for local sightseeing. The temple is well accessible by road from Delhi, Noida and Ghaziabad. One of the most beautiful spiritual site in Delhi, Swaminarayan Akshardham Temple is perfect for a visit throughout the year. The temple remains closed on Mondays. Evening is the best time to pay a visit to the holy temple.